OK, I got it. This device is similar to a very sensitive cooled digital CCD camera combined with multispectral light source. "MELAFind uses sophisticated algorithms and computer software to identify atypical lesions. These are things the human brain cannot do," said CEO Gulfo on a June 29 conference call. OK, good. Well, I’m not sure that this is OK now. Melanoma can be cured easy if it diagnosed on early stage. But melanoma patients whose cancer had spread to their liver survived for an average of 124 days (or 398 days if treated with DCTH technique). What may happen if this MelaFind approved. For example you find some suspicious new mole after beach season (if you are very careful) and visit your dermatologist doctor. He scanned your mole with MelaFind and said that “sophisticated algorithms and computer software” found that you are melanoma free. And he didn’t do biopsy and didn’t send it for analysis. After several months melanoma may spread to liver and … Gloomy picture. No, thanks, I will ask my doctor to do biopsy (may be even slightly painful) and send it for cancer analysis. "Agenda: On November 18, 2010, the committee will discuss, make recommendations, and vote on information related to the premarket approval application for MelaFind, sponsored by MELA Sciences. 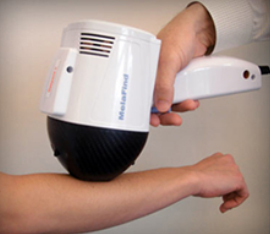 MelaFind(R) is a non-invasive and objective multi-spectral computer vision system designed to aid physicians in the detection of early melanoma from among clinically atypical (those having one or more clinical or historical characteristics of melanoma, such as asymmetry, border irregularity, color variegation, diameter greater than 6 millimeters, evolving, patient concern, regression, and ``ugly duckling'') cutaneous pigmented lesions that are non-ulcerated, not bleeding, and less than 2.2 centimeters in diameter, when a physician c hooses to obtain additional information before making a final decision to biopsy to rule out melanoma." Sure that most of panel members are doctors dermatologists who saw tens thousands of suspicious moles. And by voting for MelaFind approval they must to confess that their eyes, brain and experience cannot to compete with this this digital CCD camera that "uses sophisticated algorithms and computer software to identify atypical lesions". Will they do it? I'm not sure. Disclosure: I don't have positions in MELA now. "The paper shows that MelaFind's performance satisfied all primary and secondary sensitivity and specificity endpoints, as defined by the study protocol and a Protocol Agreement between MELA Sciences and the FDA. The Protocol Agreement calls for 95% lower confidence bound on sensitivity to be greater than 95% and for MelaFind® to be more specific than the study physicians at a p-value of less than 0.05. Since the measured values of sensitivity were very high, the "exact mid-P" statistical method was used to compute the 95% lower confidence bound. Specificity endpoints were based on relative performance of MelaFind® and investigators, with significance established at p-value less than 0.05. In order to generate a comparison with dermatologists' biopsy sensitivity to melanoma, MELA Sciences conducted a parallel pilot readers' study with 39 other dermatologists who were blinded to the study results. Importantly, the average biopsy sensitivity of the readers was only 80%, and the inter-reader variability was high. "The pilot reader study found that dermatologists do miss early melanomas," study author Kenneth Gross, MD, said. "Only 20% of the melanomas in the pilot reader study would have been biopsied by all readers and different readers missed different melanomas. Thus, even though all lesions in the clinical trial were biopsied by the examining dermatologists, many of the melanomas would not have been biopsied by other dermatologists, underscoring the need for an objective tool to aid in the decision to biopsy. We believe that the results of the pivotal trial and the pilot reader study underscore the clinical utility of MelaFind® as an objective tool to aid clinicians in the detection of early melanoma." It seems like very impressive. But what is means "reader study"? "Such studies have been widely used to evaluate diagnostic performance in mammography and colonoscopy. In dermatology, readers are presented with a series of images of lesions (clinical and/or dermoscopic) and, for each image, may be asked to decide whether a lesion is a melanoma and whether it should be biopsied to rule out melanoma. Assuming acceptable quality of images (clinical and/or dermoscopic) and availability of patient history, and taking into account the fact that most of the training of dermatologists is actually done with such images, reader studies can provide estimates of sensitivity to melanoma. Such studies have been performed in dermatology to evaluate the effectiveness of teledermatology, to compare the diagnostic performance of dermatologists and primary care physicians, to assess the dermoscopic examination of lesions, and to determine the diagnostic and biopsy sensitivities of dermatologists. The pilot reader study conducted as a part of this clinical trial included a random sample of lesions enrolled in the trial and provided readers with the clinical over-view, a clinical close-up image, contact dermoscopic images, and patient demographic and melanoma risk factor information; all images were checked for quality by an experienced dermatologist. The average biopsy sensitivity of 39 dermatologist readers was 78%, which is similar to a prior reader study by Friedman et al." Citation from new paper. It’s like the famous artist painting's images were presented to experts and they were asked to identify between originals and fakes only based on these images (even very high quality images). According to Mela, the U.S. Food and Drug Administration believes "the fatal risk of missing melanomas (two of 127) is not worth the marginal benefit of a clinically meaningless reduction in biopsy ratio compared to dermatologists." "* FDA saysrisk of error not worth marginal benefit: Mela"
I covered MELA today at $3.30 (+36% gain). It seems like this price is close to MELA bottom pps. FDA must assign PDUFA date for MELA in nearest future and this event may generate MELA pps spike to $4 range (based on illusion hope for FDA approval for MelaFind). Actually this spike will be again the good opportunity for shorting MELA. A tiny laser which can detect signs of skin cancer could save thousands of lives, scientists say. The device fires a double laser beam, with less combined energy than a laser pointer, into a suspicious mole, then analyses the locations of different skin pigments. Scientists then look at the amount of eumelanin in the pigments - which is present in greater amounts in potentially cancerous tissue. It is the first time the techinque has been used, and in tests, a team succesfully identified all eleven samples with melanoma - the deadliest form of skin cancer. Even with a 50 per cent success rate, the device could prevent hundreds of thousands of false diagnoses of the disease across the world each year, says Thomas Matthews of Duke university. Skin cancer is the fifth most common cause of the disease in men and the sixth most common in women. In research published in Science Tranlational Medicine, the team say they plan to study thousands of archived skin slices using the laser, to predict its accuracy. Currently, doctors use either a light and magnifying glass to study a mole, or perform a tissue biopsy. Prof Warren Warren, of Duke's Center for Molecular and Biomolecular Imaging, said that the first method was a '17th century technique that is only 85 per cent reliable'. A biopsy was not much better, he added, with studies showing that in 14 per cent of biopsy diagnoses doctors disagree whether or not cells were cancerous. If they are not sure, they tend to follow a policy of 'when in doubt, cut it out', adding to the costs of treatment and potentially removing healthy cells. With the new technique, a suspicious mole would still have to be removed for a final diagnosis of cancer, although the team are working on ways to scan a mole without removing it. Well, if it's true, this device will finally kill MELAFind. It seems like this new device is simpler and cheaper than MELAFind and it's more precise. Thus, MELA is doomed. Sept 26 (Reuters) - Mela Sciences inched closer to a U.S. regulatory approval for its skin-cancer detecting device MelaFind, and the medical device maker's shares more than doubled in pre-market trade. The device, which assists physicians in the treatment of melanoma -- the deadliest form of skin cancer -- was approved by European regulators earlier this month and the company's shares have gained about 9 percent since then. The European approval on the device was a big milestone for Mela Sciences, as Europe has the largest recorded cases of melanoma. On Monday, the company received an approvable letter for the device. The FDA issues approvable letters when it classifies a device as approvable pending additional information. The company has been trying to get FDA approval for more than two years now. It had submitted a marketing application in June 2009. Mela Sciences plans to start the device's European launch in Germany, where over 20,000 Germans are expected to be diagnosed with melanoma by 2016." Question is to buy or to short MELA? An approvable letter is not approval yet. Even if approved will dermatologists to buy it after FDA said: "the fatal risk of missing melanomas (two of 127) is not worth the marginal benefit of a clinically meaningless reduction in biopsy ratio compared to dermatologists." From science poin of view MELAFind is just very expensive and useless toy. As any optical device it needs adjustment and control imaging. It may also produce false results for different skin color. How many devices MELA may sell in Germany? 100 in 2016? 1 per 200 patients. One missed melanoma because this device said "no biopsy needed" and it will be very big problem for dermatologist who believe in this. Disclosure: I have MELA short positions.